The song ended and the tempo of the music slowed. His hands wrapped around her waist pressing his muscled hips and thighs against her. She followed the slow sensual movement of his body. Fingers lightly stroked her back, mesmerizing her with their touch. Alex felt the warmth of his breath at the base of her neck, stirring the embers of the fire Rumor had started earlier. The words to the song seeped into her brain fogging her thoughts with the sensual undertones they inspired. Rumor leaned in taking advantage of their closeness. Warm lips caressed the sensitive side of her throat, shivers moved through her body. Alex tilted her head slightly, giving him greater access to her slender neck. A soft moan escaped her lips. His tongue licked its way up the side of the neck behind her ear, gently nipping the tip of the lobe. Desire flowed through the blood in her veins, taking with it her resistance. Rumor whispered something low and seductive in her ear as his wolf emerged taking control of the man. “What did you say?” She stopped moving. The music blasted around them, everyone else moving, dancing. “I asked if you wanted to go find a room in the back.” His hands moved down her back to slide over curvy hips, drawing them back against him as he began to move again. “I know you want me, Alex. I can smell your desire.” He pulled her roughly against him. His wolf was on edge, the smell of her arousal overriding his common sense. Alex could feel how excited he was. She didn’t need a nose for that. “I do want you but that doesn’t mean I’m going to do anything about it tonight.” Alex’s eyes flashed angrily conveying the fury within. Lorna Eames is a sucker for a happy ending. 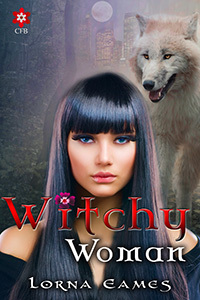 She writes paranormal romance books because even witches and werewolves need love. When not writing she is often found at a hockey game or exploring sunny Las Vegas where she resides after transplanting herself there from northern Indiana. She has two wonderful, supportive daughters, a wacky son-in-law and an extremely skittish black cat. Her first book Witchy Woman is coming soon from Crimson Frost Books.